PES doesn't quite hit the mark this year. What is it? The latest in Konami’s football series. Multiplayer? Online and up to four players locally. 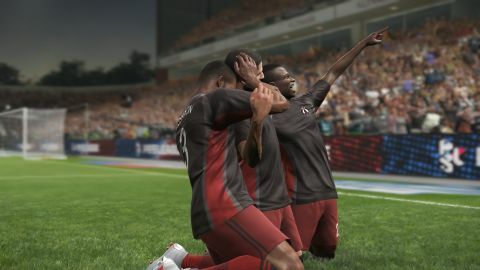 Pro Evolution Soccer 2019 reminded me just how good Konami's football games can be—and why I've been playing FIFA instead for years. The slow pace requires precision, patience and deliberate build-up play, and putting together a 10-pass move ending in a volley from the edge of the box is a better feeling than anything you’ll find in FIFA. But poor AI and intermittent online connectivity have given me more headaches than those moments of glory are usually worth. Not all that much has changed since last year. There are no new modes and no game-changing new controls to master. You’re also still playing, largely, with unlicensed teams, so expect to see Man Blue up against West London White. Some leagues, including the Scottish Premiership, are fully licensed, along with the odd team like Barcelona and Liverpool, and you can always download an options file to get the proper team kits and badges for unlicensed teams. It’s never really bothered me, especially because I spend most of my time in Master League, where you take a team of made-up nobodies to the top. Though there are no revolutions here, subtle improvements do exist on the field, starting with animations. It’s not just passing and shooting that look more realistic than ever: in my first few hours I was regularly pulling up instant replays of players stumbling after being tripped, or of the goalkeeper trying to gather a dropped ball, and watching in awe. Ball physics are also improved. In FIFA, it sometimes feels like the ball is being pulled to a player’s foot—here it bounces and bobbles, skips over the wet surface, and spins erratically after a failed flick. If you want a good first touch you have to think about both the direction you’re running in and where the ball is coming, and you can’t simply ping passes between players at will, which means putting together a slick team move feels more satisfying than ever. Shooting is a joy, as it always is in PES. Leathering one from the edge of the box into the top corner makes me want to jump out my chair—you can really give it some oomph. First-time shots capture the real-life power that you can get from putting your foot through a driven cross, and it’s something FIFA simply can’t replicate. Combine that with the excellent ball physics and you’ll score all sorts of goals. I’ve bagged 25-yard screamers, deflected scuffs that trickle into the corner, 1v1s in which I’ve slipped the ball under the keeper’s body, and first-time volleys that curl into the top corner. I’ve not scored many headers, though—high crosses were dominant in PES 2018, but Konami has gone a bit too far in making them more difficult. The ball bounces off your head like a balloon, giving the keeper plenty of time to react. Yes, headed goals were too easy last time, but they were fun, and now they’re almost completely gone. The drought of headers is the first sign that some of the changes from last year aren’t welcome, and the same is true for the AI, which is all over the place. Offline, the CPU is obsessed with getting to the byline, firing in a low cross and either burying it first time, or laying it off to another player to stick it in the net. I’d wager those crosses account for more than half of the goals I’ve conceded. On its own it’d annoy me, and I’d want more variety—but it’s made worse by woeful marking by defenders. Konami says it has improved player positioning, but I don’t see it. Whenever I’m trying to block a cross out on the wing, the CPU strikers peel off my centre backs with ease, creating space without any effort. One-twos cause havoc, and defenders always step up and fail to follow midfielders running into the box. When a striker is rooted in position and the ball is in the air, it’s practically impossible to win the header. To protect against that, I’ll take charge of players off the ball to ensure they mark their man, while holding B on the control pad to send a secondary defender to the ball. But defending off the ball is less fun, and sometimes not effective because my teammates will simply charge at the ball without any regard for the space around them. Defending in general is in desperate need of an overhaul—PES gives you much less control over a defender than FIFA does. In FIFA you can decide at what distance to pressure an attacker, and then press a separate button to step in when the time is right. In PES, holding A will take you towards the attacker slowly (you can hold sprint and A to run towards them), and you won’t stop until you win the ball, commit a foul, or watch them skip past you. You can’t properly jostle an attacker, either, so when a striker is rooted in position and the ball is in the air, it’s practically impossible to win the header. Other AI quirks include the CPU never shooting from outside the box and turning down clear runs at goal for no particular reason, even when my defenders have no chance of catching them. Often, it’ll instead recycle the ball to the wing for (you guessed it) a low cross. CPU defenders sometimes let you dribble to the edge of the box without tackling you (handy, but hardly realistic) and occasionally play a ridiculously deep defensive line, with the centre backs camped inside their own penalty box when the ball is barely at the halfway line. All these AI problems make playing singleplayer a pain. I’m still enjoying Master League, in which you start with a team of also-rans and slowly build an elite squad, but I’m liking it less than previous years. The lack of updates from last year doesn’t help either: there’s a new Master League difficulty mode in which you can get fired from your job, but it’s otherwise the same, as are all the other singleplayer game modes. PES hasn’t changed enough since last year, and it’s gone backwards in some regards, including the AI. However, for the last three days I haven’t been able to connect to Konami’s servers. The problem seems to be specific to PC, and none of the suggested unofficial fixes (here, here and here) have worked for me. Lots of other players, judging by comments on Reddit threads and Steam forums, are in the same boat, and understandably angry. Konami says it’s working to sort the issue—but its speed of response doesn’t fill me with confidence. If you want to play online, wait until the problem is properly sorted before even considering buying it. And even if you’re not playing online, you should think twice. PES 19 still produces moments of magic, and it’s still more realistic than FIFA. But it hasn’t changed enough since last year, and it’s gone backwards in some regards, including the AI. I’ll probably finish my current Master League season and dip in when I have friends around, but I doubt I’ll be playing it in six months. Even now, I’d still pick last year’s FIFA over this year’s PES.